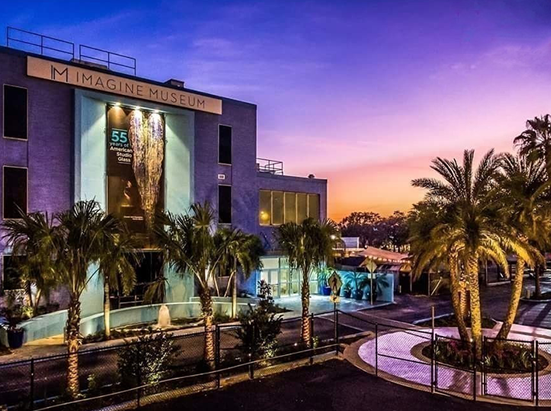 Imagine Museum is a new museum in St. Petersburg, Florida dedicated to Contemporary American Studio Glass. Currently, the museum is home to more than 500 pieces of American Studio Glass and represents over 55 artists over 55 years who were and are integral to the development of this medium as a fine art form. The 1960s cultural world was marked by creative Americans making major statements worldwide. While the world was listening to the rock and roll tunes of Elvis Presley, reading the words of J.D. Salinger, and standing in the architecture of Louis Kahn, the American Studio Glass Movement was quietly coming to life. The invention of the first studio glass furnace was introduced in 1962 by Harvey Littleton. He was a ceramic artist who understood the use of heat to make a natural material bend to an artist’s demands. He joined forces with a colleague, Dominick Labino, who presented a low-melting glass formula. Working together these two artists built the first furnace for melting glass designed to fit within an artist’s studio. This innovation allowed individual American artists to work with melted glass in the privacy of their own studios outside of the factory setting. In 1963, Harvey Littleton started the first glass graduate program at the University of Wisconsin in Madison. Soon after Chihuly received a degree from the same program and went on to study and lead the glass program at the Rhode Island School of Design. Marvin Lipofsky, another student from the Madison program established the same program at the University of California, Berkeley, California. The American artists who joined this early movement—Henry Halem, Fritz Driesbach, Mark Peiser, Joel Philip Myers, Howard BenTre, Richard Marquis—to name a few, continued to work and teach in this medium throughout the country in different ways and with different techniques. From these early influential glass pioneers, American artists continue to work in new innovative ways, using the material and creating works of art not seen before. Imagine Museum’s collection is comprised of over 500 works from various collections; notably collectors Jean and Hilbert Sosin, Alfred Merritt, and Ralph and Eve Goldstein. Our goal with this exhibition is to tell the story of studio glass from its beginnings in the early 1960s, through to the present, and to share the significant advancements and contributions made by these American artists to the overall visual dialogue of the late 20th century and early 21st century. An art movement is defined by new ways of creating works of art as well as how it pioneers a path to make an enduring historical imprint on the world of art. We believe the American Studio Glass Movement has made and continues to make a significant and enduring impact on contemporary art being made today.